A University of Texas at Arlington physicist has been awarded more than $400,000 in NASA funding to develop a 3D look at how electrodynamic energy from solar winds enters and moves throughout the Earth's upper atmosphere. Understanding interaction between the Earth's magnetic field, or magnetosphere, and its upper atmosphere – known as the thermosphere/ionosphere – is especially important this year and in 2014, Deng said. That's when the Sun is predicted to reach a time of heightened activity or its "solar max." Model, or GITM. Deng also is the 2010 recipient of a National Science Foundation Early Career Development or CAREER award. "Dr. Deng is a young professor who is already making a valuable contribution to her field, and the NASA award recognizes that," said Pamela Jansma, dean of the UT Arlington College of Science. "By helping the physics community better understand the role that space weather phenomenon has on Earth, she is creating a vital new tool." 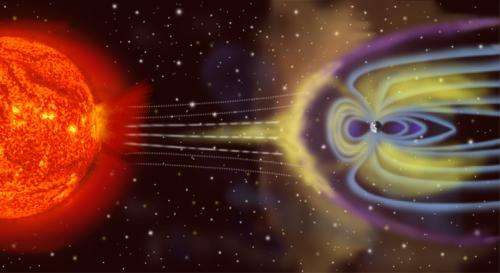 Solar wind is plasma from the Sun that travels through space at about 400 kilometers per second carrying with it a magnetic field. Usually, the Earth's magnetic field protects it from this plasma radiation. Solar flares and other activity on the Sun's surface can increase the energy traveling toward Earth, with some of the radiation passing through the magnetosphere at the Earth's magnetic poles. Energy entering the thermosphere/ionosphere after a solar storm can wreak havoc on scientists' ability to track the satellites that orbit the Earth in that region, anywhere from about 100 to 500 kilometers above the ground.